There are several things that everyone looks for in a garbage disposal. They include a quiet motor, an easy level of installation, and a warranty that covers any replacement parts – at the very least. I tend to look for all of those things and more because the overall size of the disposal matters. This is why I like the KitchenAid 3/4 hp Garbage Disposal. This unit is reliable, easy to install, and rather quiet. It hits all of the “buttons” so to speak. 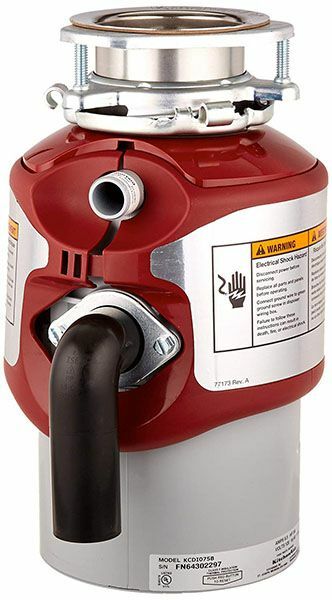 I’ve tested this appliance extensively, and am going to review it here, and will even include some comparisons to other garbage disposals in order to paint a full picture of how much I like this machine. 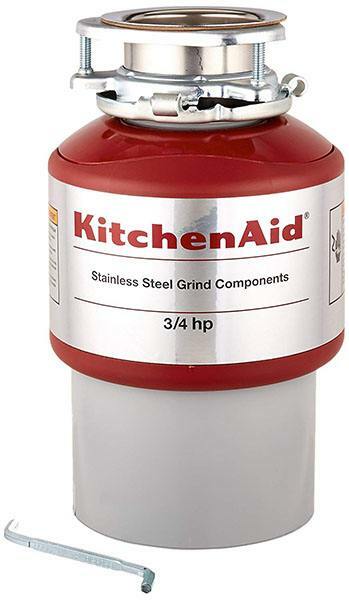 To begin with, the KitchenAid 3/4 hp Garbage Disposal, also known by its model number as the KitchenAid KCDI075B, is a continuous feed machine. There is two main type of garbage disposals. The continuous feed is one of them. These machines are designed to work constantly – you can turn it on and then push food scraps down them. The machine will do the rest of the work. The other type of disposal requires you to place all of your food scraps in it, plug the feeder (usually a sink drain), and then turn it on. I’m not fond of this second type, because I hate to let my food scraps linger in my kitchen. It’s much easier to have a continuous feed model. The KitchenAid KCDI075B has a motor that spins at a consistent 1,725 rpm, or rotations per minute. If this sound fast, well, that’s because it is. 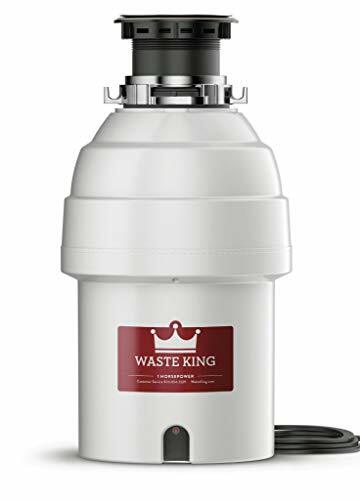 It is designed to grind up all of the food waste that you put down it, as long as you adhere to the general rules and avoid things like meat, eggshells, and bones that should never be placed in a garbage disposal. Although I’m not going to go into a lot of detail on these regulations in this review, it goes without saying that as long as you treat this disposal with respect, it will last for a long time. This garbage disposal has a stainless steel grinding wheel and shredder ring, both of which add to its longevity. You need a disposal that is practically guaranteed to last. Even if the installation process is easy, you still want to get your money’s worth out of it. I understand how important this is. Also, this KitchenAid KCDI075B comes in red (which will look snappy every time that you open your cabinets) and weighs 18.5 pounds. It’s slightly heavier than similar units, but that’s because it’s entirely made of stainless steel. You won’t find much plastic on or in this appliance. It also comes with a five-year limited manufacturer warranty, which is set up to cover any defects that may have occurred during the manufacturing process. Overall, this disposal is 13.5 inches tall by 13.5 inches wide and 10 inches long. I think that it does take up quite a bit of space under one side of my sink, but that’s fine by me. I like the fact that it’s heavy duty and reliable. That more than makes up for its size. This KitchenAid disposal is designed to work with a dishwasher, and it has a manual reset button built into it. 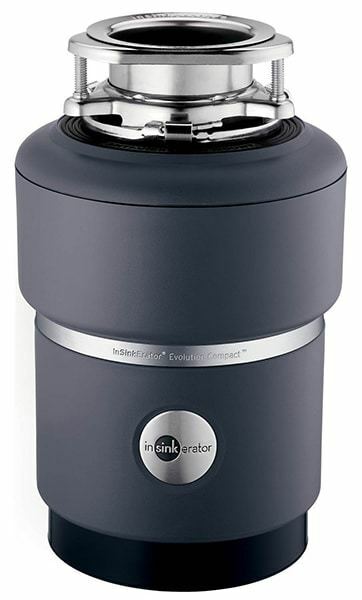 It also has a 50-ounce chamber, so it will hold a lot of food scraps before you turn it on. Despite this fact, I find that running it every day works best. I hate to have my food scraps decompose in the machine. Anyone who’s made or seen a wedding shower registry is no doubt familiar with the KitchenAid brand, thanks to their colorful and expensive countertop mixers. However, for the sake of this review, I’m going to include some information about the company. KitchenAid, the makers of the KitchenAid KCDI075B that I’m reviewing here, is currently owned by Whirlpool, another company that makes home appliances. KitchenAid started in 1919 by the Hobart Company. The spinoff company was designed specifically to produce and sell stand mixers. The company is still known for these mixers today, although the design has been modified over the past almost 100 years. KitchenAid currently manufactures their appliances in five different parts of the United States, including Arkansas, Indiana, Ohio, Mississippi, and South Carolina, as well as in two Canadian provinces – Quebec and Ontario. They also make some products in China. KitchenAid’s appliances are sold throughout the United States and are known for their bright colors and their longevity. I think that everyone should have at least one KitchenAid appliance in their home – even if it’s just the KitchenAid KCDI075B disposal. The KitchenAid 3/4 hp Garbage Disposal is known for its easy installation. While you do need to have some basic plumbing knowledge, just about anyone can accomplish this task simply by following the installation instructions. Of course, if you end up getting stuck in the middle of the process, you can always call in a plumber or at least someone with some plumbing knowledge. With that said, the KitchenAid KCDI075B is so easy to install that a novice can do. As far as noise levels are concerned, you will have a little bit of noise when the disposal is running. There’s really no way around this. However, the disposal is very quiet considering the fact that it’s grinding kitchen waste into chunks and disposing of them down the drain. You’ll find its noise level to be moderate to quiet. At least, that’s what I think. I believe that the device is very quiet compared to the noise that some of my previous disposals made. Now, let’s compare the KitchenAid 3/4 hp Garbage Disposal with another model. For fun, I’ll compare it to the Waste King Legend Series L-8000. The main issue here is the fact that the Waste King is a very powerful unit – almost too powerful for the home. It runs at 2,800 rpm and is really better suited for a commercial kitchen than a home. With that said, both models are the continuous feed variety and are designed to turn on with the flip of a switch. Both are also very quiet and simple to install. The main difference between the two is the amount of power that they give off. Obviously, the Waste King model runs on more power, as it goes faster. This doesn’t mean that the KitchenAid model is bad. Instead, as I already pointed out, you may not need something as powerful as the Waste King in your home. You’re better off with the KitchenAid. I think that the KitchenAid KCDI075B is a great garbage disposal. It’s a small workhorse located under your sink. 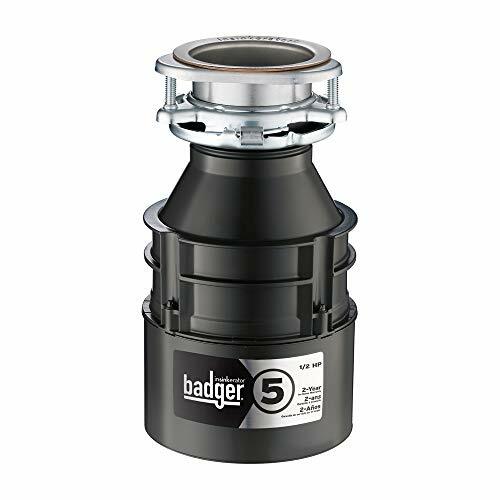 If you want a disposal that’s quiet, easy to install yourself, and very reliable, then you really can’t go wrong with this one.